Khalid Ali-M Aldawsari/lubbock sherrif's dept. A 20-year-old Saudi student living in Lubbock, Tex., who allegedly considered targeting Americans including President George W. Bush and soldiers formerly stationed at Abu Ghraib, was arrested late Wednesday on terrorism-related charges. 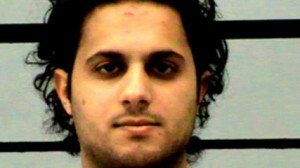 The Justice Department charged Khalid Ali-M Aldawsari with attempted use of a weapon of mass destruction in connection with his purchase of chemicals and equipment to make an improvised explosive device (IED) and his research of potential U.S. targets. “As alleged in the complaint, Aldawsari purchased ingredients to construct an explosive device and was actively researching potential targets in the United States. Thanks to the efforts of many agents, analysts, and prosecutors, this plot was thwarted before it could advance further,” Assistant Attorney General David Kris said in a statement. An FBI affidavit alleges that on Feb. 1, a chemical supplier reported to the FBI a suspicious attempted purchase of concentrated phenol, a toxic chemical, by a man identifying himself as Khalid Aldawsari. Authorities said Aldawsari tried to have the phenol order shipped to a freight company so it could be held for him there. However, the freight company returned the order to the supplier and called the police. Later, Aldawsari falsely told the supplier he was affiliated with a university and wanted the phenol for “off-campus, personal research.” Frustrated by questions surrounding the order, Aldawsari cancelled it and later e-mailed himself instructions for producing phenol, authorities said in a press release. The affidavit alleges that in December 2010, he successfully purchased concentrated nitric and sulfuric acids. The affidavit said Aldawsari used various e-mail accounts in researching explosives and targets, and often sent e-mails to himself as part of this process. He also e-mailed himself instructions on how to convert a cellular phone into a remote detonator and how to prepare a booby-trapped vehicle. The affidavit also alleged that Aldawsari conducted research on various targets and e-mailed himself information on these locations and people. One email listed targets including hydroelectric dams and nuclear power plants. On Feb. 6, 2011, the affidavit alleged, he sent himself an e-mail titled “Tyrant’s House,” which contained the Dallas address of former President George W. Bush. He had also collected addresses of three American citizens who had served in the military and had been stationed in Abu Ghraib, authorities alleged. Posted: 2/24/11 at 2:26 PM under FBI, News Story.